Since Keri’s a friend of the blog and a Revolutionary Mom herself, we said sure. While we’ve never tackled this sort of thing here before, we thought we’d give it a go. Besides, she offered to thrown in a free book to one lucky commenter (see, Obama hasn’t even been president one whole day yet–and already your fortunes could be changing!). Caryn: The day your book arrived was one of the craziest I’ve had in a while–though it wasn’t entirely atypical. Just a busy day trying to wrangle the kids, rushing here and there, trying to meet some last-minute writing deadlines, all on about 5 hours of INTERRUPTED sleep. I remember looking at the cover (at a stoplight–because I intercepted your book from the UPS guy on my way out the driveway), hearing two of my three kids snap at each other in the backseat, and seeing the words “rest” and “simplicity.” In that moment those ideas seemed like more of a joke than a reality–or at least something that was not attainable in this stage of life. What do you say to other moms who might think these concepts are just out of reach? Carla: I love Caryn’s question and it echoes mine. Keri, I LOVE the ideas behind your book and I so want rest and peace and calm and balance. But it does feel so out of reach. Even finding the peace to read about how to find peace feels out of reach. So what are some “in the middle of the chaos” secrets you can share with moms who might not have or know how to make the time to get time to themselves? Keri: I guess I would answer those this way. Living a life of Sabbath Simplicity doesn’t mean that you are always resting. There will be times when you are busy or even overwhelmed. God told us to work hard for six days, and then rest for one. So that means we fully engage in the work we are called to do–whether refereeing squabbles, doing laundry, running errands, doing our jobs (such as writing those articles). But we set aside one day to rest from all of that. It’s a rhythm of life. But what does that look like? It looks different in different seasons of life. I encourage people to build their Sabbath practice slowly, one step at a time. I imagine that as you were in your car, you were off to run errands, with your little ones in tow. You sometimes have to do that. But what if you decided that on Sundays, you won’t run errands? Sabbath is about freedom, and you can set yourself (and the kids) free from that stressful experience on that day. Choosing not to do things like housework or errands one day a week will set that day apart. And it’s hard to explain, but that experience will provide a peace that you can hold on to that during the stressful times. You mentioned sleep, which is huge. For some of us, the first step on a Sabbath Simplicity journey is to get enough sleep one night a week. You can endure a lot if you know that one night a week, you’ll get enough sleep. Caryn: Cool. Thanks for stopping by, Keri! So what do the rest of you Revolutionaries think? Do you like what she has to say about rest and sleep and “Sabbath Simplicity”? If so, she says a lot more in her book, Rest: Living in Sabbath Simplicity . You can buy it at bookstores or at Amazon. OR you can try to win it by leaving us a comment! Maybe tell us what how rest or sleep or simplicity or Sabbath observance has revolutionized your life. Or tell us how you think it COULD revolutionize your life. Or tell us a revolutionary way to find rest or to get sleep or live simpler or observe the Sabbath… You get what my own tired, tired brain is saying here. Carla and I haven’t decided how we’ll pick the winner, but we’re certain it will become obvious. So we’ll tell you how we decided, after we decide. Comment away! That’s what they had to say? But really, what more do they have to say about any of the rest of us? Now I realize I’m just being super-sensitive here, but come on! I’m so tired of moms getting all the plain vanilla or should I say “white women from Kansas” labels. No offense to white women from Kansas. I know many. And they are all terribly interesting people. And all quite capable of raising future presidents. I don’t see what’s at all “unlikely” about that! Can we at least TRY to give moms a bit more intrigue? Sheesh. Carla: Oh Caryn, I’m so proud of you for being outraged on behalf of Obama. I know it’s really his mom, but it’s a step. 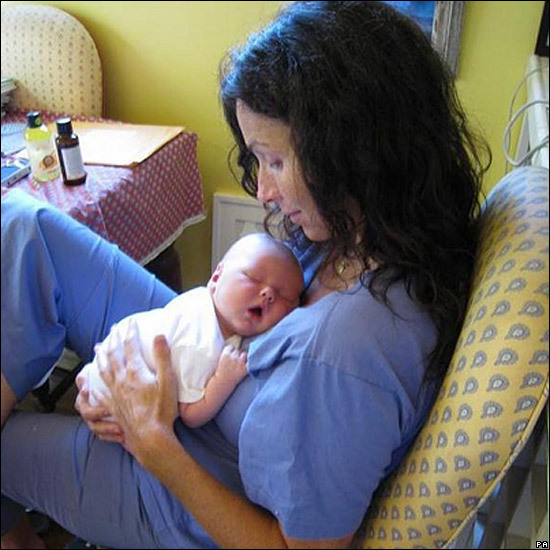 This, if you can’t tell, is actress (or maybe I should stick with “white woman from England)” Minnie Driver and her one-month-old son, Henry. This picture, one she herself posted on her myspace page, makes me love her more than I already do. She looks tired, unkempt, and totally in love with her boy. I can’t tell you how much I appreciate her showing the world that motherhood is not a photoshoot. Moving on….yes, that Minnie Driver photo is fantastic. Beautiful image of motherhood, capturing one of my favorite kind of mom-moments. And that white boy from California is darling. Little mouthie catching flies…..